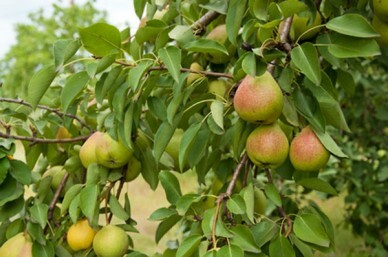 When selecting a tree be sure to choose one with the correct size rootstock for your plot. As a guide M27 rootstock will grow to about 2m tall, M9 2-3m, M26 3-4m while M25 is a full size orchard tree. Also remember that trees can be self-fertilising, so can be planted alone, or non self-fertilising meaning they need to be paired with another tree. The cost of a bare root tree is a lot less than a container grown one and in my experience a young, slightly smaller tree which is bare-root grows and establishes a lot better. 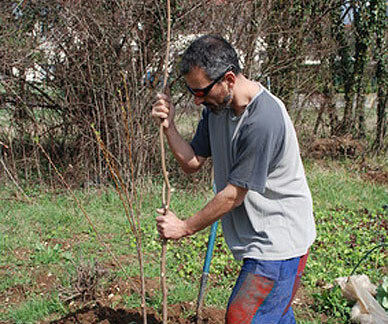 The best time to plant fruit trees, especially bare root, is during their dormant period from November through to about March, try to wait for a mild spell as planting in frozen soil is not recommended for obvious reasons. You shouldn’t plant in times of growing activity and certainly not during mid-summer. The pit depth and width is governed by the spread of the roots or size of the pot, as a rule of thumb make the pit one and a half times wider than the spread of the roots or the size of the pot and about 100 mm deeper. Once the pit is dug loosen the soil in the bottom of the pit about 100 mm and if you have poor quality soil add some compost just to give the tree a good start. Loosening and compost also helps with drainage of the soil if very claggy. If you decided on a container-grown tree you must prise out the roots around the root structure (if it’s rootballed then leave the hessian and wire in place, just loosen the top) in order to help it take in water when planted. If you have bare root trees you don’t need to prise the roots out but it is always a good idea to soak the roots for a couple of hours before planting – never let the roots dry out. I always find it a lot easier to put a supporting stake in before you backfill the hole – don’t tie it yet though. Look for a gap in the root system that allows you to place the stake about 50mm away from the main stem and bang it in firm and upright taking care not to hit the overhead branches. Back fill the hole with some nice loose compost and soil mixed together, as you’re backfilling give the tree a little shake up and down just to make sure the compost fills in around the roots. When backfilling a container tree it’s the same concept but you don’t need to shake up and down as the soil around the plant root system will already be nice and compact. The soils should be nice and firm but not solid, as you could damage the root system. When backfilling don’t fill too high above the bottom of the trunk as this can ‘suffocate’ the tree. Once the soil and backfill material is in place, have a final check that there are no roots left above the surface of the ground level, this goes for both the bare root and container grown. Now it’s time to support your tree: as you will have already staked a bare root you just need to tie it; I like to put one tie about a foot up from the soil level and one about two inches from the top of the stake. I personally prefer to stake container grown trees at 45°, as opposed to just driving a stake through the root ball, to avoid unnecessary damage. Tie the trees using a material such as rubber belting. This is very soft on the young tree trunk and can be loosened as the tree grows. You should check ties periodically to ensure they have not become too loose or too tight. Whatever type of tree you have don’t forget to water it in well and to keep it watered if there is no rain during the planting season. Be careful not to overdo it though as waterlogged roots won’t function properly and may rot, ultimately killing the tree. You should also apply a mulch to discourage competitive weed growth around the roots and help retain moisture. Finally remember that rabbits and deer love fruit tree bark and will munch on your new trees if they are not adequately protected. If you have a problem with rabbits you can keep them away with wire or purpose made tree guards, larger deer will require sturdier fencing. Thanks to Carlton and Cuffie of Oasis Landscapes for this article. They provide garden maintenance and landscaping services in Hertfordshire and the surrounding areas.